A huge smile came to my face as I looked through my holiday photos of our visit to The Millennium Garden at Pensthorpe in Norfolk, England. 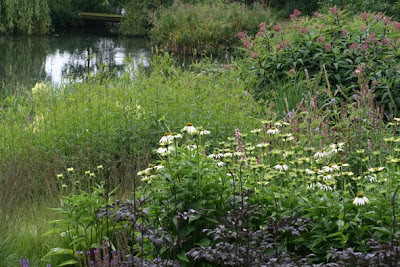 This visit was made all the more special as we had visited Pensthorpe for the wildlife and huge fan of the Dutch plantsman Piet Oudolf that I am I had no idea he had designed a garden there! On checking my link for him I see his website now shows images of this garden and some others too. I was like a girl looking through the sweet shop window as the shop was about to close when we discovered this garden - we were about to leave for the day. I was standing in front of the entrance gate! Nope… I just couldn’t rush this garden. So, with such anticipation in my heart I turned around and walked away to return again a few days later. 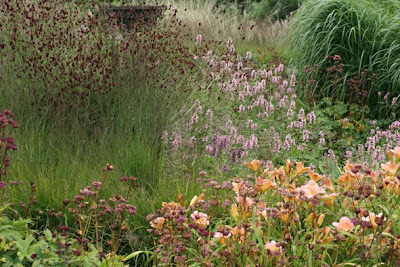 Piet designs in a naturalistic way with grasses and huge drifts of the same plant or colour – oh if I only had a spare field! Most would probably say that the pictures I have shown here are not this garden at its best but that now is the best time to see it with its seed heads, dry grasses and cobwebs. That is definitely what I would have thought too looking through the books on my bookshelf. I wasn’t expecting to be blown away with his bold use of colour too. I absolutely adore his use of form and shape in his plantings like the spires used in the photo above. They are repeated again and again weaving their way into the distance. Walking through the different heights and blocks of colours is just quite magical. Mixing foliage textures in his planting even in areas with less ornamental grass ratio absolutely captivates me. Much of this can be scaled down and work in our own gardens. I always play around changing my plantings anyway but oh… to have a field. Large block plantings of water lilies in the pond and lush foliage with dots of strong colour around it looked fantastic especially with the almost black foliage plants almost mirroring the surface of the water. Oh… I’ll stop chattering on for a moment and let you look in peace at a few more views from this wonderful garden. This last selection of photos will wake you up with a start if this garden has made you a little dreamy! This is mid July colour and what a riot it is too. What an absolutely fantastic contrast to the huge weaving blocks of dusky flowing ornamental grasses. 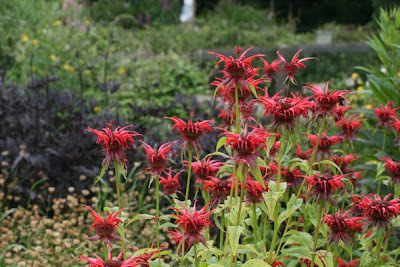 The red monarda was the plant that really caught my attention. I am absolutely thrilled to be able to share my garden visit with any Piet fans reading this. I know I have thoroughly enjoyed my visits (through blogs) to other Piet gardens including his own private one – thanks Yolanda. If you are new to Piet’s style of gardening I hope that you too have enjoyed this tour. If you want to read/browse some of his books - my bookshelf proudly holds the list of books below. Ah… and if you are looking at plants and plans for your own garden next year I hope this gives you some inspiration. 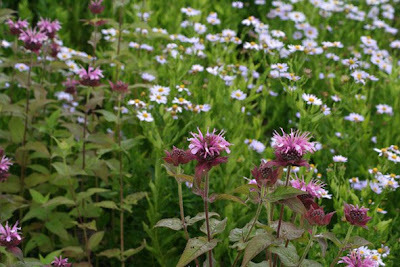 Dream Plants for the Natural Garden by Henk Gerritsen and Piet Oudolf. 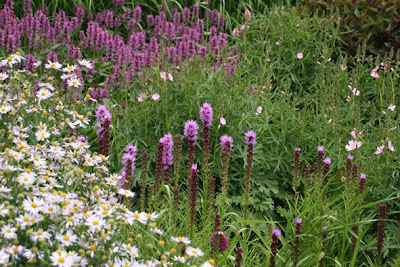 Designing with Plants by Piet Oudolf and Noel Kingsbury. 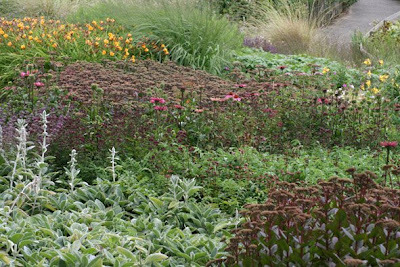 Planting a Natural Garden by Piet Oudolf and Henk Gerritsen. 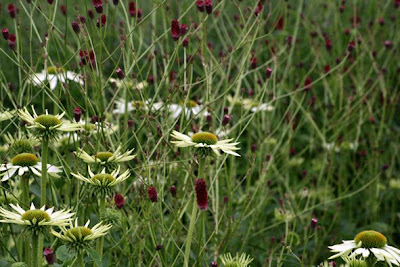 Gardening with Grasses by Michael King and Piet Oudolf. Oh… but wait a minute this garden style celebrates movement in the garden. Okay, you’ve twisted my arm… here’s some video of the garden too. Unfortunately moving the camera on plants that are already moving makes for less than perfect resolution after processing. However, the photos above in no way show the scale of planting in this garden or the true height of the plants. Watch out for the few people I caught walking around the garden with me as they will scale the garden for you. I really hope you will enjoy the walk too. Finally, I do have one more posting to come from my visit to Pensthorpe which will be on the birds. Sorry, I'll have to keep you waiting a little longer for that one. The video and photos above were all taken on July 22nd 2008. Shirl - absolutely delightful - thank you. A perfect start to the day to look at you homage to Piet! Now, have you visited The Walled Garden at Scrampston in Yorkshire. If you haven't then it should go to the top of your list! Awesome! 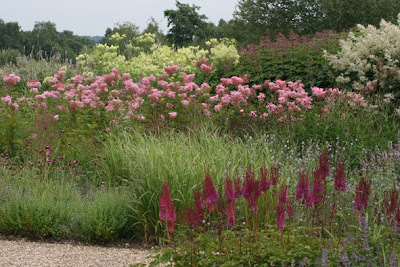 Gorgeous - I have read a few articles about Piet but its lovely to see so many photos of one of his gardens. 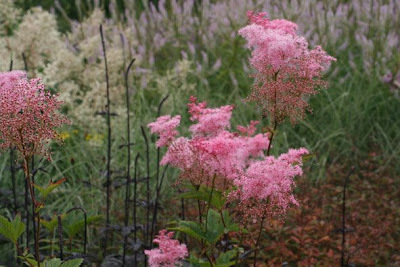 I had got an impression in the past that they were predominantly grasses but the colours of the perennials really show through. I wonder what they look like in the winter though! You've made my day. Thank you. 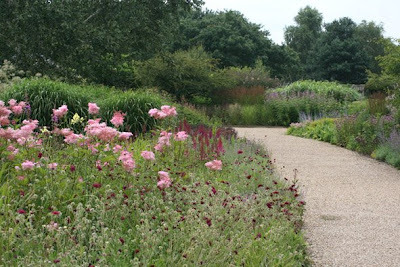 I'm a long-time fan of Piet Oudolf and have seen photos of Pensthorpe in his and various other books, but your photos and, especially your movie clip, bring it to life. I really appreciate being able to see more of the way the garden is structured and the scale of the plantings. I only wish I could afford the plants required to make those massive, monocultural blocks of plants he uses. I suppose I have to find a way to do more of my own plant propogation. This posting is like a gift. Thanks again. I loved the video. 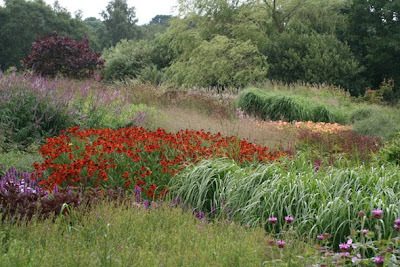 I like Oudolf's grass planting but more so when he includes lots of flowering plants - then the effect is superb. 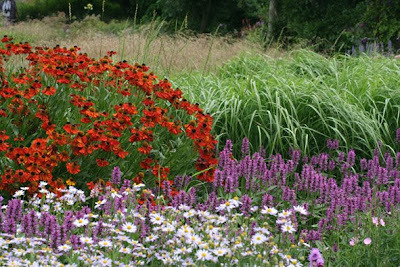 I'm particularly keen on the height he achieves with the very tall grasses and perennials that are normally stuck at the back of the conventional flower border. He puts them to the fore where you can really appreciate their beauty and the way they move in the breeze. What a beautiful series of flower photos! Yor photos made my day. I'm digging deeply into his dreamplant-book at the moment, discovering that a huge amount of the plants listed will surviv up here in the north. This man really has shaken my ideas about gardening and plants. A hero! By the way, in the picture with the gazebo... just after you say you're going to "stop chattering" (nonsense!) 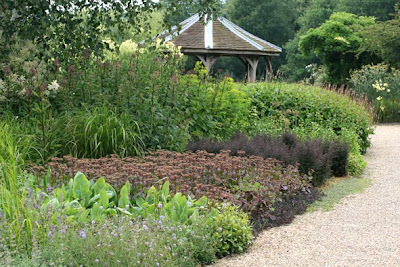 and let us see some pictures... what is the dark purple planting behind the sedums? I'm afraid that you're going to say that they're dark leaf barberries (because I've sworn not to plant those here) but I love that look in the garden! patientgardener - I’m so glad you enjoyed it and I have been able to show you this garden for real. Yes, the colour was fantastic – that was a surprise to me too. Ah… but the winter months will see this garden almost frosted in time, misty with magical cobwebs. I love that look in a grand scale but perhaps couldn’t go for it in my small garden. Huge drifts. That is what I want in my garden. 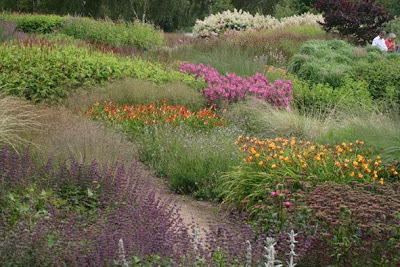 Gardens designed by Oudolf are like paintings, full of harmony and light colours. I regret not having a big park, otherwise half of it would be filled with grasses of all sorts and in large drifts ;-) !! Unfortunately I don't manage to see the video. Perhaps I should try again tomorrow!Thank you for these beautiful and very impressive pictures! This is simply delightful, Shirl. I saw one of Piet's gardens in Chicago a year ago this month, and the grasses were in full bloom and the coneflowers were dying beautifully, just as he planned. 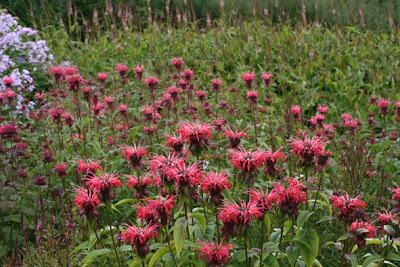 But it's great to see one of his gardens in summer, with the coneflowers and bee balm in full color and the grasses not yet at peak. Finally the garden that came as such a big surprise to you on your hols. :-D It's great Shirl and it reminds me very much of Piet's own garden and his nursery too as most of the plants I see here, are grown in his nursery. Loved the vid; a gorgeous garden always goes so well with classical music, don't you think? Just incredible. I have his books - but thanks so much for sharing images of this simply beautiful garden. Breathtaking. Pam – I am glad you have enjoyed it. Great you got a chance to see his Chicago garden - I’d love to see that one too. 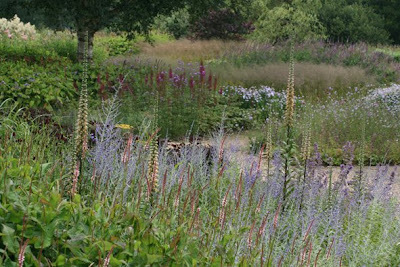 I’d also like to see one of his gardens in the winter with frost and spiders webs – however this summer garden at Pensthorpe was a real eye opener for me. I found his use of colour quite stunning. Hi Shirl, what a beautiful, inspiring garden! Thanks so much for sharing your visit! 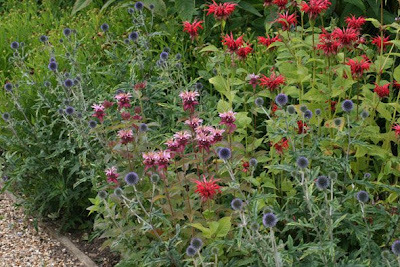 Great picture's of Piet's garden; stunning planting. This might seem like a daft question but please could I ask you what month where you there? The reason I ask is that I am putting together a garden design for a garden show in June 2009 (My very first attempt at a show garden). Most of the garden will be the Stipa variety known as Angel Hair, and I am a little worried that have misjudged ths plant and it might not have the height I need in June. What do you think? I'd really appreciate any tips you could offer. Wow… that should be fun attempting your first show garden! Stressful too I bet. Good luck with that – I can understand your research at this time. Not a daft question at all. These photos were taken on July 22nd. I am not familiar with the Stipa Angel hair but in my Scottish garden the grasses do put on a lot of growth between June and the end of July. I couldn't say if it would be tall enough. I don’t know how Dublin compares as a growing season. If there any other queries on dates of photos I usually have them mentioned at the end of a post in grey italic text. I am thrilled with the post, beautiful photoghraphs and, of course, Piet.